My name is Jenny and I live in Geelong, with my husband and 3 sons aged 7, 9 and 12. I was born and raised in Geelong. My husband and I met at high school and have happily settled in the outskirts of Geelong raising our 3 boys. I feel like we have the best of both worlds living here, close to the coast, the beautiful beaches and Melbourne is only a short trip away. I started Amaya handmade in 2011. 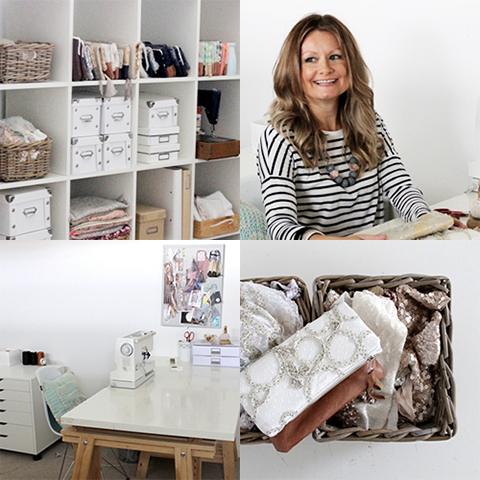 I was an at home Mum and I borrowed a sewing machine to create bags in the evenings while my children slept. It was a way of having time to myself and I really enjoyed being up late creating. I gave away many of my bags as gifts and had been admiring the talented sellers on sites like Madeit and realised many had started out just like me, so I decided to give it go. When I got my first sale and the buyer ordered 6 more bags I couldn’t believe it. I make clutches and bags. My favourite styles are made using elegant fabrics combined with rustic leathers. Someone once described it as rustic glam. My favourite fabrics to work with are sequins, silks, linen and laces, vintage and new teamed with all kinds of leather. I really enjoy using rustic distressed leathers that have a real character about them and add uniqueness to the bag. My creative process always starts with a beautiful fabric and I design around it and see what will work and where it will end up. It’s a great feeling to see it coming together and finally the finished product. If I ever feel creatively stuck, which we all go through at times, I’ll take a break from sewing and reorganise my fabrics. I find pieces I’d forgotten about and I’m soon inspired again. Fashion sites are good inspiration. I love glamorous dresses with stunning fabric and colour combinations. For as long as I can remember I’ve been into craft and creating. My mother is very creative and a beautiful sewer, she taught me to sew at a young age. I’ve always loved anything DIY and if I couldn’t find exactly what I was after then I’d attempt to make it myself. My business name doesn’t really have an exciting story to go with it. I wanted something pretty and after much searching came across the name Amaya which I read somewhere means “night rain”. I quite liked that so that was it, Amaya handmade. I’m a fan of Pinterest, Instagram and tumblr, they’re all visually appealing and great for inspiration and keeping up with trends. My advice is to jump in and just make a start. It’s a constant learning process, and it’s encouraging to see the development of your craft along the way. Be patient. Try to develop cohesiveness across your brand and good product photos are a must. You don’t need the most expensive camera to take good photos. There are endless recourses online to help with getting started. Advertising is integral to getting yourself found and to build familiarity with your brand. It’s important to actively drive traffic to your store and not to wait and hope people will find you. Social Media of course is a useful tool and effective in getting yourself known. Embarrassed to say this but one lesson learnt the hard way was been too trusting. I thought I’d built up a good relationship with a wholesale customer overseas, I’d had a repeat orders but made the mistake of sending a large order before payment was received. A big loss and a big lesson. Besides creating I love keeping fit. Fitness is a big part of our lives as my husband has a business organising sports events. I enjoy running and working out, it’s something I need in my day, to feel good and to be able to keep up with my busy boys. Music - I love Paul Dempsey and Something For Kate, The Killers, Brandon Flowers, Eddie Vedder, Mumford and Sons, Muse… anything really. Books - I’m not a huge reader but I loved Under The Tuscan Sun by Francis Meyers, and any of Lorna Jane’s books, she inspires me to keep fit and healthy. Dr. Zuess books are a favourite to read with my boys. Films - I don’t have a favourite film as such, but I enjoy anything with Denzel Washington and a good suspense/thriller. My perfect day would be spent with my family, getting in a run, some sewing and shopping, followed by a night out with friends.